LOADED WITH WHEY PROTEIN ISOLATE – FITSHAPE Whey protein powder is made up of the highest quality protein sources, and that starts with the first source being whey protein isolate. Fast absorbing and very bio-available, it is widely regarded as the highest quality source of protein. HIGH QUALITY MUSCLE FOOD: FITSHAPE Whey proteïne is fast absorbing and has a clean profile to help you reach your nutrition and fitness goals. If you are packing on weight or cutting calories, FITSHAPE Whey isolate loaded whey protein powder is the protein powder that can get you there. Independent Lab Tested in insure 100% Label Claim and Purity. AMAZING TASTE PROFILE: FITSHAPE Whey Proteïne is formulated not only for an amazing taste but it also mixes easily and smoothly in your drink of choice. No chunks, great flavor, no stomach bloating. Nothing but high quality protein powder to fuel your muscles and a taste you will look forward to every time. 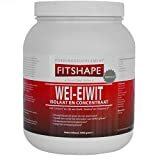 Fitshape Whey-protein is one of the most popular food supplements. As an athlete, you know the importance of protein for muscle growth and repair, but do you realize that (in) sufficient proteins also have a great influence on your immune system and overall health? As humans we can not do without them because it is necessary for all bodily functions. Most proteins are found in meat, fish, poultry, nuts, dairy and soy products. Fitshape Whey-protein is the perfect daily supplement on a diet for athletes! Whey-protein concentrate, whey-protein isolate, vanilla flavor, xanthan gum (thickener) Vitamins: L-ascorbic acid, DL-alpha-tocopheryl, nicotinamide, calcium D-pantothenate, pyridoxine hydrochloride, Thiamine Mononitrate, Riboflavin, Folic Acid, D-biotin. Cyclamate (sweetener), Saccharin (sweetener). Contains lactose and proteins from milk. Use 3 servings daily: right after training, before sleep and / or one between your meals. Dissolve 4 scoops (approximately 33.3 grams) of whey-protein in a glass / shaker with milk or water. Stir and shake it well and you are ready to drink it. Do not exceed the recommended daily dosage. This product is available in packages of 1000 and 2000 g in the flavors Chocolate, Vanilla, Banana and Strawberry.